A new wave of female labor leaders are winning by thinking big. Even as the traditional labor movement falters, hitting a ninety-seven-year low in membership rates, female labor leaders like Jayaraman are on the rise and becoming highly visible. Women workers, who were all but shut out from unions in the 1930s, when the movement first gained real power, have been pushing into the top ranks. Mary Kay Henry is president of SEIU, one of the largest unions in the country. Randi Weingarten heads the American Federation of Teachers. At the AFL-CIO, Elizabeth Shuler is the secretary-treasurer and Arlene Holt-Baker recently retired as executive vice president. Lower-profile leaders are also making headway—and meeting with success. Karen Lewis, president of the Chicago Teachers Union, made headlines around the country when her members went on strike in 2012 and won important concessions. At the helm of the New York Taxi Workers Alliance, Bhairavi Desai secured a fare hike that benefits taxi drivers. And outside the traditional labor movement, in the so-called “alt-labor” sector, female leaders dominate: Jayaraman at ROC United, Ai-jen Poo at the National Domestic Workers Alliance and Caring Across Generations, Nadia Marin Molina with day laborers at the National Day Laborer Organizing Network, Sarita Gupta at Jobs With Justice, and Madeline Janis bringing workers together with other groups in Los Angeles through LAANE. These women are bringing new ideas and strategies to labor organizing, many of which are borrowed from the women’s movement—like making the connection between what workers face on the job and what they’re dealing with at home. They don’t only target corporate bosses but bring together a variety of stakeholders within communities to fight for change in the workplace and beyond. And they’re bringing an influx of new members to the movement by reaching out to primarily female workforces that have often been excluded. Most importantly, for a movement accustomed to a steady erosion of power: they’re winning. Women have only recently made headway into real positions of power in organized labor, after making slow progress over the movement’s history. “The male leadership have been very pleased to accept the assistance and support of women union activists and leaders,” said Ileen Devault, a professor of labor history at Cornell, “but they haven’t been so eager to give them actual power in the union movement.” The early labor movement organized workers by occupation, in highly gender-segregated workforce, women were often left out of jobs that became unionized. Even when women began to be organized, they were relegated to segregated locals. By the mid-1930s, union leaders began to realize that success would rest on organizing all workers at a workplace, no matter their gender, race or skill, explained Roosevelt Institute Fellow and labor expert Dorian Warren. That’s when women began to make gains in leadership. But women labor leaders aren’t only found at the top: between the late 1980s and late 1990s, the percentage of female lead organizers increased from 12 to 21 percent. Meanwhile, the rise of the “worker centered movement”—groups such as the National Domestic Workers Alliance or ROC United that aren’t formal unions but help workers organize and advocate for better conditions—has been more effective at fostering the leadership of women and people of color than traditional unions, Warren says. While in college, Jayaraman started working with homeless and at-risk young women, eventually founding WYSE, or Women and Youth Supporting Each Other, to help middle school girls take better control of their lives. After Ai-jen Poo began volunteering at a domestic violence shelter for Asian immigrant women, she developed a “growing hunger for getting at the root causes of the issue,” which were largely economic. The biggest challenge facing many of the poor, immigrant women she worked with was finding a job that could support their families and free them of their abusers. Poo and Jayamaran are not the only ones bridging the women’s movement and labor movement—many of the female labor leaders do—and that background that means innovative thinking about what constitutes “workers’ issues.” Poo’s organization Caring Across Generations, a coalition pushing for improved working conditions for those who work in the home and better choices for those who need the care, partners with women’s organizations like 9 to 5. Jayaraman has partnered with national women’s organizations on campaigns, and often reminds us that the low tipped minimum wage is a paycheck fairness issue, lowering women’s wages over all—not to mention that women in the industry are paid less than men. These leaders are also borrowing tactics and strategies from the women’s movement and bringing them into labor organizing. Instead of focusing solely on the traditional contract provisions over wages and hours, many of them are tackling issues that affect workers outside of work, including childcare, schools and housing. Jane McAlevey, author and former labor organizer, notes that it’s typically women who think most about things like access to quality childcare and pay discrimination. Those issues fall outside of a typical union contract—but are central to workers’ ability to hold a job and feed their families. “[The new leaders] come out of other movements and other political formations, which gives them a broader vision of what the labor movement could be,” says Warren. And as Ellen Bravo, director of Family Values @ Work, which lobbies for better work/family policies, put it, “These are movements that cross gender and race. We have to recognize racial and gender injustice and fight to end them at the same time we’re ending injustice for all.” It’s a much larger battle than counting union cards. Labor organizing wasn’t always so focused on just the workplace: as McAlevey notes in her recent book Raising Expectations (and Raising Hell), after the anti-communist witch hunts, the post-1955 labor movement turned from radical, militarized tactics to “a narrow focus on ‘bread-and-butter’ issues like wages.” Eventually, laws such as the Taft-Hartley Act forced unions to limit themselves to contract negotiations over wages, hours and working conditions, with a narrow focus on engaging directly with the employer. While organizing low-income workers in Stamford, Connecticut, McAlevey developed a strategy she calls “whole-worker organizing,” that, as she describes it in her book, “seeks to engage ‘whole workers’ in the betterment of their lives.” She and the AFL-CIO won a dollar and a half raise for workers there. Then she found out that members who lived in low-income housing were in danger of being kicked out to make way for redevelopment. If they couldn’t stay in their current housing, most of them planned to leave the city for somewhere cheaper. “If these women lose their houses and we won a dollar raise, even if we won them healthcare and a pension, it doesn’t matter,” she told me. She turned her focus on preserving workers’ housing, asking members to go to their clergy, rabbis, PTAs and others in their communities for support. After she helped the workers save four public housing projects from demolition and win $15 million in new state funds for improvements, non-union workers began to ask whether they could get a union in their workplace, too. “It happened organically,” she recalled. McAlevey’s approach blends the two realms, public and private life, which have historically been gendered—men go to work and care about wages, women stay home and care about the roof over their families’ heads and what’s for dinner. But focusing on mobilizing workers alone is no longer enough. “If you want to contend for power, and workers need a lot more power than what they have in this country right now, we actually have to bring power to the table with us,” McAlevey explains. In September 2012, with Lewis at the helm, the union decided to strike not only over wages and hours but about the changes foisted onto schools by education reformers. The union worked to “connect the dots for people” between attacks on teachers and worsening educational outcomes for their kids. Before the strike began, CTU released a research paper with its own plan to improve education. Its main demands of the city included smaller class sizes, improved facilities, arts and music instruction, access to Pre-K and kindergarten and comparable teacher salaries and professional development. “To me, underlying this issue were issues of respect,” Lewis said. Saru Jayaraman is trying to pull off something similar. At ROC United, she isn’t simply seeking to raise workers’ wages but to change the way the restaurant industry treats workers: to offer better benefits, include workers in restaurant management and treat women and people of color fairly. ROC isn’t picking a fight between workers and their employers; instead, the organization works to build support for industry reform among workers, employers and consumers. “Our model is about embracing and addressing the needs and concerns of these three stakeholders to ultimately transform the industry for the better of all of them,” Jayaraman explained. The group conducts campaigns demanding improvements to poor workplaces. But it also encourages restaurants to take the “high road to profitability,” as she put it, by providing assistance to those looking to treat their workers better and making examples of those who do the right thing by their employees. And ROC is tapping a constituency that labor groups often overlook: consumers. If the “foodie” movement has pushed restaurants to offer local, organic and sustainable menu items, could it also get restaurants to care about working conditions for restaurant staff? Consumers “care about where the food comes from,” says Jayaraman. “Now it’s time to think about the people who touch their food.” This is pretty far outside the normal purview of a labor union, but for her, it’s crucial. “I think the only way we’re going to be able to really lift standards at this point for working people in America is being creative, thinking about it a little differently, reaching a much wider audience than we’ve been talking to and shifting their perceptions about work,” she says. Employers became a vital ally to domestic workers in New York, where Domestic Workers United pushed the Domestic Workers Bill of Rights through the state legislature. Now in her work with Caring Across Generations, Poo has brought together workers and caregivers with disability rights groups, elderly groups and youth groups that advocate for those on the employer side. The intimacy of domestic work “has always really shaped the way that our members and the way that our movement thinks about strategy,” she said. “It’s natural for folks to want to try to create solutions that work for everyone,” not just workers. 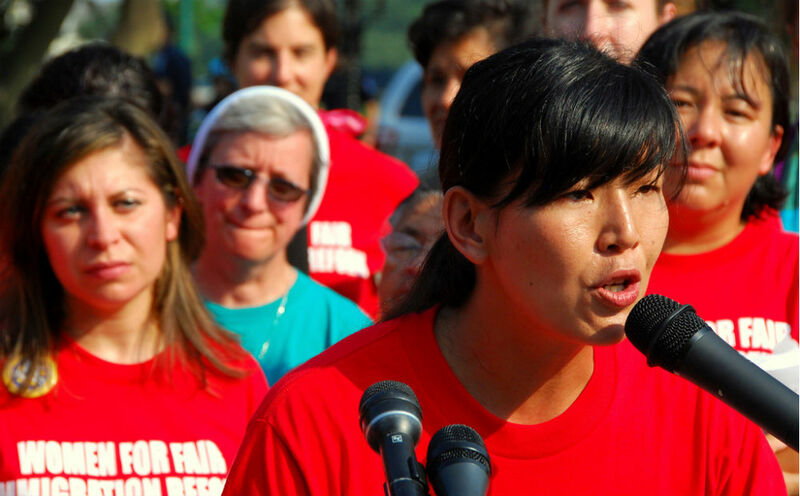 The groups she works with to organize domestic workers are also moving beyond demanding wage and overtime rights to larger issues like healthcare benefits and immigration reform. Does it sound utopian? Well, something is working, because the list of wins on each woman’s resume is vast. ROC United has “won 11 campaigns against exploitation in high-profile restaurant companies, obtaining more than $6 million in stolen tips and wages, as well as policy changes to improve the lives of thousands of workers,” as Jayaraman writes in her recent book Behind the Kitchen Door. Desai, of the New York Taxi Workers Alliance, led a campaign in 2012 that successfully raised taxi fares in New York City by 17 percent while easing a credit card fee and cracking down on abuse from medallion agents. In a time of increased vilification of teachers, Lewis’s strike resulted in some important wins. Poo built on the success of the Domestic Workers Bill of Rights in New York, the first of its kind, to enact two similar bills in Hawaii and California last year and pushing similar bills in other states like Massachusetts, Ohio, Oregon and Texas. Last year, the Department of Labor finally expanded labor rights to home health aides, another NWDA-backed victory. In Stamford, McAlevey helped 4,500 workers form unions and win first contracts. Later, her work in Las Vegas won nurses a contract with benefits, organizing rights for part-time workers and the formation of a committee to examine new rules for subcontracting. And these new leaders are growing the labor movement by organizing the low-paying and non-unionized sectors where women are concentrated—that is, where the labor movement can expand. Women make up more than 70 percent of restaurant servers, they comprise over three-quarters of all public school teachers and they make up over 92 percent of registered nurses. Ninety percent of home health aides and 95 percent of domestic workers are women. Any organizer could try to unionize this new frontier, but research shows that having a woman at the helm gets more results. “Simply put, when organizers and lead organizers reflect the workers they are organizing, they win,” wrote Dorian Warren and Kate Bronfenbrenner in a 2007 paper. They looked at traditional labor organizing and found that the win rate in National Labor Relations Board campaigns for female lead organizers averages 53 percent, more than ten points ahead of male ones, and that shoots up to 69 percent for women of color. Even more important is that this effect is compounded when the race and gender of the organizer aligns with the workers: women of color who organize units with over three-quarters women of color have a win rate of 89 percent. Leaders like Poo, Jayaraman and Desai still face daunting challenges. Private-sector unionization has fallen to less than 7 percent. Women still lag men in the ranks of union members. Chicago Mayor Rahm Emanuel has closed fifty schools, much to the chagrin of Lewis and her fellow teachers, proving that their strike is far from the final word. While California finally passed a Domestic Workers’s Bill of Rights last year after a defeat the year before, it got whittled down before passage, and Oregon’s House passed a bill that was later voted down in its Senate. Meanwhile, although employers of domestic workers and home health aides are supportive of Poo’s organizing work, others worry about an added cost burden and oppose minimum wage protections. But as the labor movement continues to struggle to build itself back up to the strong social movement it was decades ago, it would do well to work even harder to integrate women into the leadership and the rank and file. The female workforce holds perhaps the greatest opportunities for worker organizing, and women leaders are the most likely have success. Female leaders’ ideas and strategies are creative and unique—and bringing about surprising results. Incorporating women is one way of reinvigorating a movement still struggling to bring itself back to power. Editor’s Note: An earlier version of this piece stated that Arlene Holt-Baker is an executive vice president at the AFL-CIO. In fact, she retired in 2013.